I liked it, not a lot but a bit. The third one, (The Book of Vile Darkness) is worth watching although it has a much lower budget and no star names. Jeremy Irons is having a blast in this one. One of his lines is, "Let their blood RAIN from the skies! ", and it's one of the most over the top deliveries in the history of film. Best part of the film, easily. Bruce Payne is also fun - he returns for the lower budget sequel, which is probably a better movie even though it's bad too. Welcome back, Jim: long time. My nephew is ten - I wonder how he would react to this? I remember the cardboard axe the dwarf had, man that was some hilarious stuff right there. I have no problems with fantasy being for everyone (in fact, as a fan and unknown author of the genre, I believe that it's how it should be), but this one just had s**tty quality overall, and zero respect for the source material. 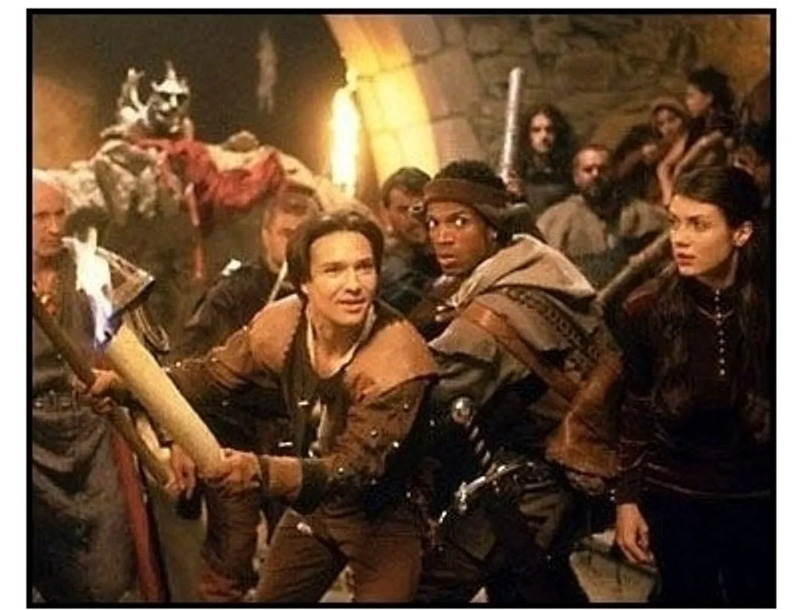 I say stick to other fantasy flicks like Dragonhearth, which stomps this film to the ground. Hell, even the ultra low budget Hawk the Slayer is a thousand times more awesome than D&D, and the soundtrack is the most crazy thing ever. Still, in my opinion, if you want to introduce a young one to fantasy, just show him Willow. That movie is perfection. By the way, wasn't Jeremy Irons in the equally crappy Eragon? The one with the dragon that could talk without moving her mouth and had a hot-line voice. It seems like he enjoys this kind of stuff. I remember him from other serious -and actually good- titles like The Man In the Iron Mask and Kingdom of Heavens, but those weren't fantasy but rather medieval, or historic, whatever you wanna call it. I remember watching in stunned amazement at Jeremy Irons in this one and thinking he should take up doing voice acting for animation, cos it certainly felt like he phoned this performance in. Good guess Gabriel Knight. Jeremy Irons was in the film, playing Brom. Though, it may have been a role he should have passed on, considering the pasting the film got at the box office. On a film budgeted at $100 million, it only earned $75 million at the domestic box office. While the international box office got it pass the breakeven point, it probably did not make enough to turn a profit. Which killed off any idea of making the next 3 books in the book series into films. It is one of those typical film mistakes--make enough changes from the book to the film (over 50)--to alienate the fans of the book, but not the right changes that would attract someone who has not read the books. And for clarity, I have neither read the books nor seen the film. Jeremy Irons had a small but important part in "the time machine" but man, he shined in it. I forgot to add that the film looks like it was shot on 8mm film and the entire thing was lit by some guy holding a torch over his head. Thanks Trev! Glad you're still around. I've got a 13 year old nephew, think he'd enjoy it, I'll report back if I ever get around to it. Jeremy Irons is a hoot in this one. As to why he was in it, it was his DESTINYYYYY!!!!!!!!! I think Trevor should do a full review of this one.